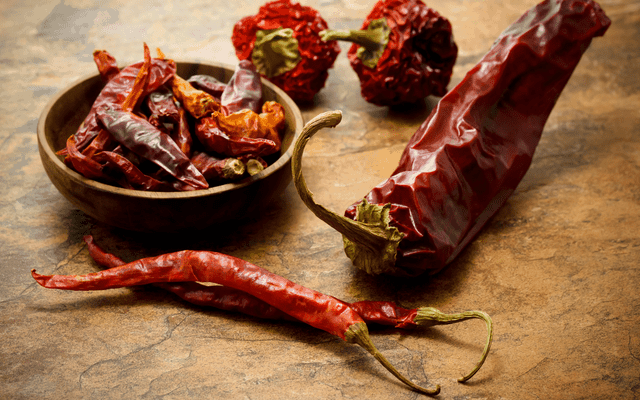 What Is Calabrian Chili ? What Makes Calabria So Special For Chilis? The palate of the nation is always on the lookout for something new, exciting and adventurous. That special taste which brings flavor and punch to bland food, an ingredient that will have your guests asking for more. Calabrian Chili could be one of many ingredients that inspire you to create beautiful, tasty culinary masterpieces. The Calabrian Chili peppers are a variety of peppers that originates from the Calabrian region of Italy. The chili is small but oozes flavor, with a combination and variety of tastes that is simply unique. Although predominantly spicy, there is also a salty, smoky and even fruity taste to this delicious peppers. It is almost blood red in color, reminiscent of the famous Ferrari red which also originates from Italy. For anyone who loves Italian food, there is a good chance that you tried this hot pepper before, as they are regularly dried, pickled or stuffed and then submerged in Olive Oil. These type of peppers are a very versatile ingredient, but it can sometimes be seen as a little too hot and spicy. Of course, there are many people who consider that a bonus and, in some areas of the United States, Calabrian Chili peppers are replacing Sriracha, the famous hot sauce, as the flavor of choice. The little red chili can be used as a pizza topping, as a lunchtime boost for a sandwich and even added to salami for an authentic Italian taste. Calabrian chili paste, or as some call it Bomba di Calabria, is also made with this particular pepper from Calabria and it’s the perfect addition to any meat or pasta dishes. At the time of writing there is no known dessert or ice-cream that incorporates Calabrian cayenne, but no doubt someone is working on how to add this popular spice to a dessert. For anyone looking for a way to bring a little heat to their food, Calabrian Chili Oil could be the perfect solution. For the more adventurous, homemade Calabrian Hot Pepper Olive Oil is not particularly challenging to make; in fact, the most significant problem could be sourcing the ingredients. It is certainly worth finding a supplier, because the oil can literally garnish any dish of your choice, including meat, salads and fish. Many stores in the United States may actually refer to Calabrian Chillis as peperoncini so that could be a good place to start your quest. A bunch of peperoncini is normally relatively inexpensive, between two and five dollars. Remember to look out for the gorgeous deep red color. Get a clothes peg or some other equipment which will allow you to hang these peperoncini out to dry. Check them every few days, and remove those not drying properly or getting black. Always wear gloves when handling these peppers, some people even advise to wear swimming goggles. The reason for this is to avoid rubbing or touching the eyes after working with chili. Wearing goggles may look rather stupid, but is certainly a preferred alternative to a sore and painful eye. There are very few spices which convey so much passion to have their own festival. But that is exactly the case with the Calabrian hot pepper. 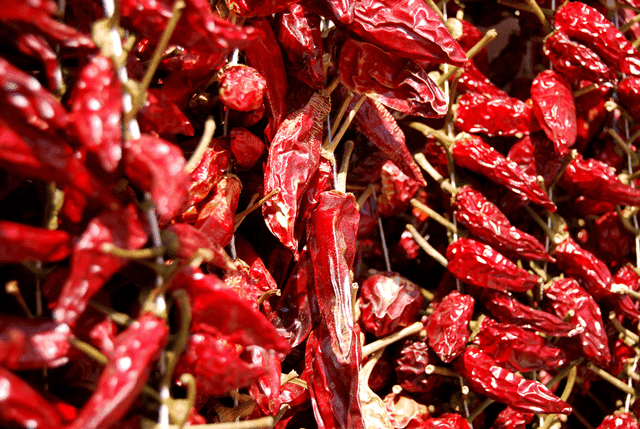 Diamante, Calabria holds an annual festival which celebrates its locally produced foods, namely peperoncino. The event takes place every September and lasts a week. It has established quite a reputation, attracting visitors from all over the world. The festival incorporates poetry, plays, dances,and speeches, as well as many fun tasting sessions and challenges. There are even different varieties of chilis including Chocolate Chilis, Chili flavored cheese, and cannelloni. The atmosphere is something special, and the small roads of the town are closed to traffic. Different food types flourish and grow in certain regions across the world, and Calabria is no different. Profiting from over 300 days of sun every year, Calabria has the perfect climate for chili to flourish. Chilis are versatile for food preparation, providing a quick way to add color and heat to any dish. And the beauty is that there are many different varieties to chose from. The varieties differ in appearance, color, and intensity; Let’s examine some of the more popular ones. 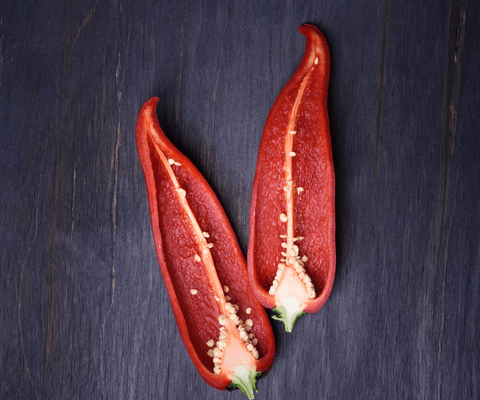 Peperone Dolce – Surprisingly not all chilis are hot and spicy, and this variety is actually sweet. Add fresh in salads, or roasted and skinned and for pasta sauces. Naso Di Cane – This one comes in both a mild and a hot variety, so be careful which one you choose! If you want to expand your culinary horizons, try the Speciality Produce App. This free app allows people to share their product finds and recommendations, also in total anonymity. It is an excellent tool when traveling abroad as it introduces you to different types of food. Although we are lovers of Italian food and spicy tastes we would still recommend our readers to try chili. You might be surprised at just how delicious they genuinely are, let us know about your experiences.